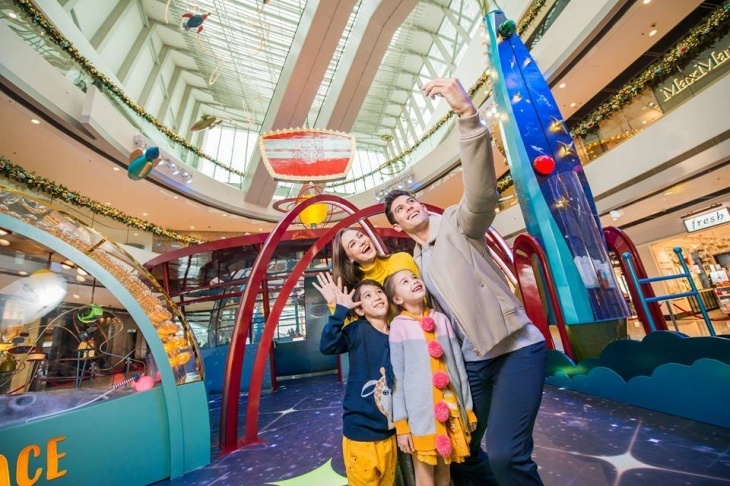 This Christmas, join the space-inspired carnival and experience “Christmas in Space” at ifc mall! Hop on the spaceship and travel along the rocket rail! More than Santa and snowmen, this year ifc mall brings an enchanting and extraordinary Christmas to its visitors. A space-inspired carnival entitled “Christmas in Space”, where Christmas trees become rocket ships and a gift-bearing Santa Claus becomes an astronaut, presents the theme of “beautiful: joy out of this world” and creates a heartwarming and lively ambience to celebrate Christmas beyond our own planet. Show your power! Send astronaut Santa skyrocketing and reach for the stars! Come and explore what's above all these control stations. Come along to soak up the festive atmosphere and share wonderful moments with families and friends, be it on earth or in outer space! You can also transform yourself into astronauts on vintage space posters! Three templates available! Smile with your astronaut helmet on! Record a fun animated video or photo with your selected vintage photo background. Share it with your friends to spread the merry spirit of your space journey! Want to make your visit an even more meaningful one? Donate HK$50 and you will receive two customized badges. All proceeds will be donated to Save the Children Hong Kong. There are more than 30 bus and minibus routes outside the ifc complex, connecting with Hong Kong Island, Kowloon, the New Territories, and the airport. There are 10 tram stations along Des Voeux Road Central, 3 of them are located near the ifc complex. Taxi stands are conveniently located outside the main entrance of ifc mall and near the entrance of One ifc.